Founded by Tommy Couch and Mitchell Malouf in 1968, the Malaco Music Group of Jackson, Mississippi has been “making black music for black people” for 50 years. World renown for their many iconic Southern soul and rhythm and blues releases and one of the last truly independent labels, Malaco has been called “The Last Soul Company.” However, Malaco has also amassed the largest black gospel catalog in the world. The company began releasing gospel records in the 1970s, but their purchase of the Savoy, Apollo, and Atlanta International labels extended the catalog back to the 1940s. This places Malaco in the perfect position for their ambitious 50th anniversary project, The Gospel According to Malaco: Celebrating 75 Years of Gospel Music. The eight disc anthology covers the history of gospel from the post-WWII-era to the present, through 100 recordings by gospel music’s greatest artists, quartets and choirs. A major part of this project is the accompanying 140-page hardcover coffee table book by gospel music historian Robert Marovich, founder of The Journal of Gospel Music website. * Rob Bowman, who annotated Malaco’s 30th anniversary box set, provides an excellent summary of the project in his forward. The handsomely illustrated book tells the stories behind the songs, but perhaps even more important, Marovich deftly weaves in the fascinating history of the company and its roster of top gospel artists. Not overlooked are the incredibly dedicated personnel who made Malaco great, such as Roy “Mr. Malaco” Wooten, Darrel Luster, Frank Williams, DA Johnson, and James D. Robinson, Jr., along with founder Tommy Couch, Sr., and newly appointed president, Tommy Crouch, Jr. The eight discs are arranged chronologically, with Disc One kicking off in 1947 with Mahalia Jackson’s iconic “Move On Up a Little Higher” on the Apollo label. Following are more greats of that era, primarily from the Savoy catalog, including the Ward Singers, Dixie Hummingbirds, Roberta Martin Singers, Rev. James Cleveland & The Angelic Choir, The Original Blind Boys of Alabama, and the Caravans. As the story continues, the discs are laden with top gospel choirs and artists from the Savoy label, while Malaco, known as king of the traditional quartets, is represented by groups such as The Highway QC’s, Jackson Southernaires, Original Soul Stirrers, Sensational Nightingales, and the Williams Brothers. The set also offers an in-depth exploration of the mass choir phenomenon through tracks from the Georgia Mass Choir, Florida Mass Choir, New Jersey Mass Choir, GMWA Mass Choir, and the most successful of all, the Mississippi Mass Choir. In 2011, an F2 tornado hit Jackson, Mississippi, destroying a section of the town as well as part of the Malaco complex. Footage of the devastation was used in the poignant video single, “He’ll Carry You” by the Mississippi Mass Choir with Luther Barnes. Thankfully, Malaco’s staff escaped injury, and the vault stood strong. The company survived and continues to thrive—surely a blessing from above. 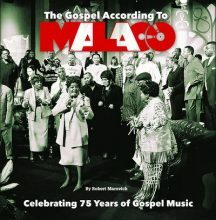 The Gospel According to Malaco is a phenomenal project that goes far above and beyond the typical compilation. Highly recommended for fan and scholar of gospel music, and every library! There is little doubt in my mind this anthology will be nominated for one or more awards. *Robert M. Marovich is Editor-in-Chief of the Journal of Gospel Music, host of the award-winning radio program “Gospel Memories” on Chicago’s WLUW-FM, and host of the video interview show “Conversations with the Gospel Legends” on the PCC Network. He is also the author of A City Called Heaven: Chicago and the Birth of Gospel Music (University of Illinois Press, 2015). Interviews he conducted with Chicago gospel artists, as well as episodes of his “Gospel Memories” radio series, are part of the Robert Marovich Collection at the Archives of African American Music and Culture. This entry was posted in Gospel Music and Spirituals and tagged Brenda Nelson-Strauss, CD review, Gospel, Malaco, Malaco Music Group, Robert Marovich, Savoy, The Gospel According to Malaco: Celebrating 75 Years of Gospel Music by aaamc. Bookmark the permalink.